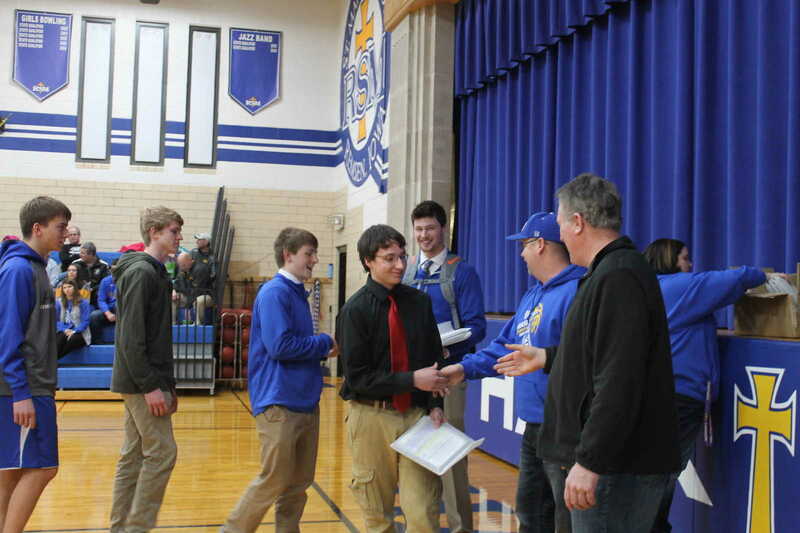 The St. Mary’s Hawk Baseball team was presented with awards for their participation in the 2018 State Baseball Tournament during the Girls’ High School Basketball Half-time at the January 4, 2019 game in Remsen. The Hawks are back-to-back-to-back state participants. The RSM team sustained only three regular season losses in the 2018 season, winning the district championship against Kingsley-Pierson and a sub-state win over Gehlen. The Hawks suffered a loss to the third seed North Linn in the quarter final game. 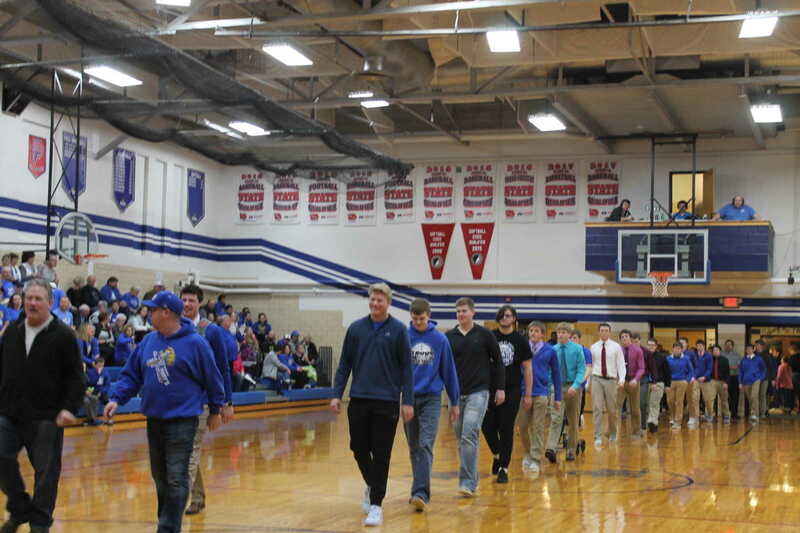 Pictured above are the coaches and team members entering the gym to receive their awards. They are: Co-Head Coach Jim Wesselmann, Co-Head Coach Dean Harpenau, and Assistant Coach Tyler Delperdang. Assistant Coach Cam Kuchel was absent. The team members present include 2018 senior players: Derrick Schorg, Brody Ricke, Zach Ruden, and Noah Brazil. Senior players absent were: David Grady, Carter Kuchel, Brett Galles, Marcus Konopasek and Mitchell Schiltz. Junior players include: Noah Schroeder, Spencer Schorg, Jake Anderson, Brady Homan, Skyler Waldschmitt, Brayden Ricke, Seth Nelson; and sophomores: Levi Waldschmitt, Blaine Harpenau, Dawson Harpenau, Jacob Gerrietts. Jeremy Koenck, Damen Brownmiller, Xavier Galles, Jacob Britt, and Stephen Brazil. All team members, seniors and underclassmen who participated in the state tournament received a plaque. Shown above are RSM baseball coaches Tyler Delperdang, Dean Harpenau, and Jim Wesselmann who had the privilege of handing out the plaques to the team members present for the awards. Those shown accepting their plaque (pictured from right to left) are underclassman Jacob Gerrietts, Jeremy Koenck, Damen Brownmiller, and Xavier Galles. 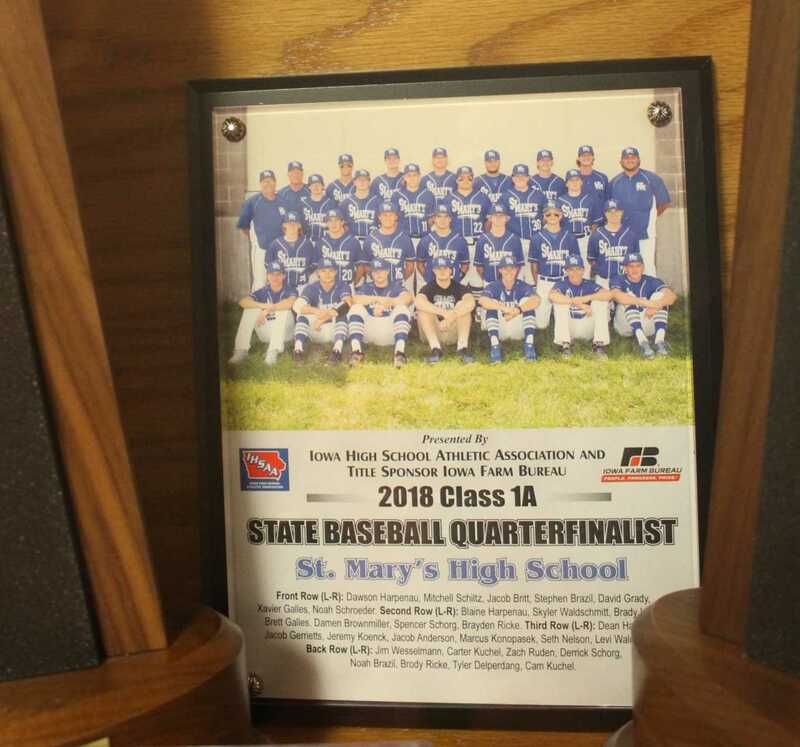 Each of the RSM state participating teammates received a plaque like this one shown in the new trophy case nestled between the 2017 State Semifinalist trophy and the 2018 Quarterfinalist State trophy.